Power Star Pawan Kalyan, chief of Janasena is known for his powerful and sensational appearances on silver screen. However after entering politics and while campaigning relentlessly for his party in the recently held elections in Andhra Pradesh, he sported a long beard and uncut hair. Many are left wondering whether he had taken any vow till the completion of the elections. During that time, in his interviews he claimed that he never had the habit of shaving when not having any film shoots. 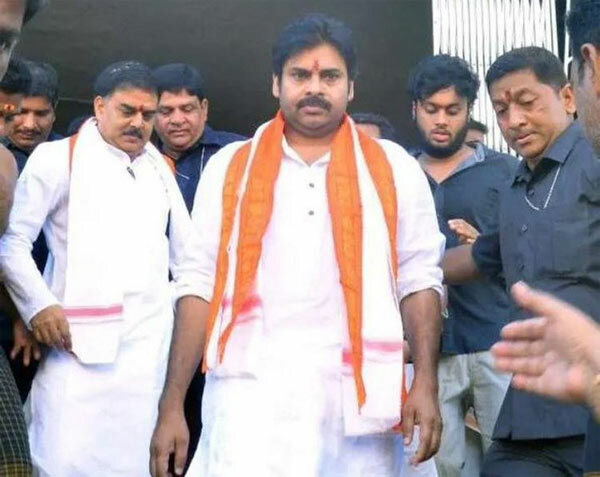 Now, proving them right, Pawan who visited the Lord Venkateswara Temple in Pedakakani, Guntur district yesterday, surprised all with the clean shaven look, after offering special prayers. His new look is going viral and all his supporters and fans are saying that Pawan looks smart and handsome without beard and he should continue with this look in future too. Pawan however seems to have put on weight. TDP Can't Play Kingmaker Role for Pawan!